Carpal Tunnel Syndrome (CTS) is caused by pressure on the median nerve as it runs through the wrist. Symptoms can include pins and needles and / or numbness especially at night, as well as possible pain and weakness in the hand. The Carpal Tunnel is a narrow passageway in the wrist opening out into the hand. It is formed by the bones of the wrist underneath and the transverse carpal ligament stretched across the top. The median nerve runs through the carpal tunnel and provides sensation to the thumb, index, middle and half the ring finger. Other structures also run through the carpal tunnel including tendons to the fingers and the sheaths around them. Anything that reduces the volume and / or increases the pressure in the tunnel can squash the nerve. When the nerve is squashed it cannot work properly and pins and needles, numbness, pain and in severe cases, weakness can result. 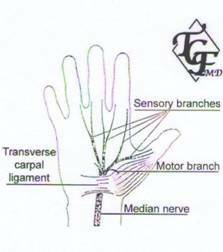 If left untreated Carpal Tunnel Syndrome can get worse and permanent nerve damage can result. If you think you might have Carpal Tunnel Syndrome you should consult your Physiotherapist or Doctor for a thorough assessment. Rest from any positions or movements that make the symptoms worse is usually recommended. Custom made Thermoplastic Night Splint – can be made by your Physiotherapist. We have found that 85% of people with Carpal Tunnel Syndrome get good relief wearing these splints each night. Thermoplastics are an advanced material allowing us to mould a splint specifically for you. It is made so that it can be worn strapped loosely at night (so as not to increase the pressure in anyway). You may need to wear the splint for a good period of time and recommend you continue to wear it for a further 2-4 weeks after your symptoms have subsided. Physiotherapy – other physiotherapy treatment may include local treatment such as ultra sound and exercises specifically designed for you. Make sure you take any medications prescribed to you by your doctor such as fluid tablets and anti-inflammatories. If your symptoms fail to improve with your splint and physiotherapy you should see your doctor as you may need a nerve conduction study and even surgery in severe cases. If you have any questions regarding Carpal Tunnel Syndrome please contact Karen Burns (Physiotherapist) at the clinic on 02 4975 1622.